It takes a village to grow sales in a catering business, said Gracie Prasanson, director of sales at Jason’s Deli. “You need everyone in the store comfortable with sales.” But you also need to explain to everyone from kitchen staff to counter workers why catering is an important part of a fast-casual business. Otherwise, “what is the incentive for an hourly worker for accepting a catering job because it makes their job harder when they say yes,” she said. Prasanson was one of the many experts in off-premises sales that shared their insights at the 2018 Restaurant Takeout/Delivery/Catering Symposium in Denver, put on by MonkeyMedia Software and The Catering Institute. How to build a catering business was a big takeaway. 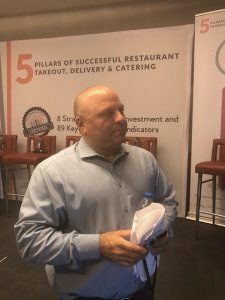 Darren Tristano, CEO of CHD Expert, a foodservice data company, urged restaurateurs to not be so enamored with third-party delivery that they overlook the bigger potential in catering sales. Some of the best practices, the operators Tristano surveyed reported, included: a centralized call center to manage orders and current key accounts; a tailored menu for catering; packaging dedicated to get the food there ready to serve; allocating resources, including a dedicated salesperson who both samples for office buildings and follows up; and, most important, strong buy in from leadership. “Catering is one of the best programs a local business can have,” Jim Vinz, President of Mongolian Concepts said. The branded vehicles give you exposure and the people eating your food at a catered event at work will seek out the restaurant on their own dime, he added. Continuing consolidations, but also multiple partnerships. And what about third-party delivery? Here the contention was to use a hybrid model, using both inhouse delivery drivers and third-party ones. In Tristano’s survey results, 34 percent of respondents had used Grubhub, with UberEats in second place with 26 percent. “What concerns me is the Grubhubs, etc, are propped up on cash right now, but can they sustain that?” Brian Schaff, founder of Mileage Scout and a former multi-unit restaurateur, said. When he was at Jimmy John, he pointed out, they deliver faster than anyone and they still got complaints about speed. Working out all the kinks in all off-premise dining options is the job for the new wave of dining.